Is there a place for friendship in the world dominated by callous health rules? For a friendship that is a misalliance. Stefan is a successful swim coach loved by women. His life is turned upside down when he meets Beetle. Beetle embodies everything that is forbidden in the Stefan's world. Will their friendship last? Will Stefan be able to kill qualms of consience in the same way as he kills the smell of his friend with scented trees? A film by animation and special effect student from Lodz film school does not give clear answers but it makes an accurate diagnosis of human relationships. 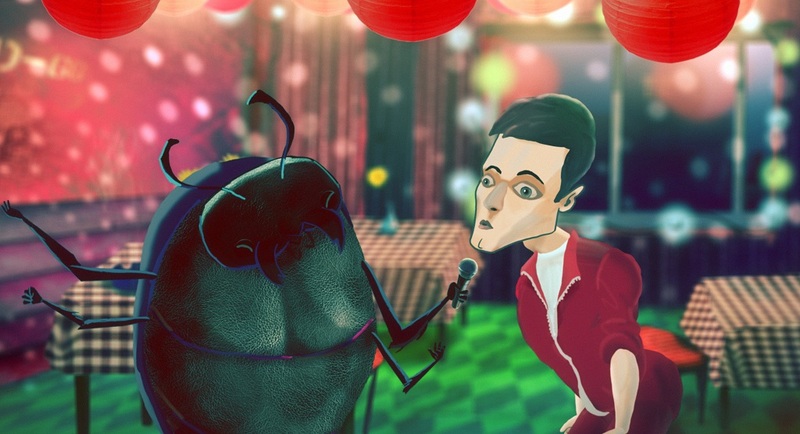 The animation about Stefan and Beetle should not be called surrealistic. On the contrary, in Piotr Hoang Ngoc's animation real reflection about loyality and alienation of an individual is hidden under the guise of grotesque realities. born in Hue/Vietnam, Piotr Hoang Ngoc is a graduate of of Polish National Art School in Warsaw (2005), a form student of The Polish National Film, Television and Theater School in Lodz, and currently a student of Culture Study at the University of Social Sciences and Humanities (SWPS) in Warsaw. He is studying under the auspices of the Copernicus Foundation’s “Young Entrepreneurs” program.